I think the worst thing for me about having kids is the mess that they create. Seriously. I am a clean freak and an organizer by nature, and it just grates on my nerves to keep cleaning up the same mess over and over again. I think every mom has a "thing" in their house that just really gets to them. In my house, it is the DVD/Game shelf. It is always disorganized, games and DVDs are always out of their case, in the wrong case, laying on the floor, etc.. It really gets to me and I hate constantly having to pick them all up, put them back where they go,and organize them day after day after day. I have made it my mission that I will get something done with the DVD/Game shelf before Christmas time (when even MORE DVDs and games are sure to make our house their home! ), and I think I am just going to go through and get rid of all of the games and DVDs that no longer get used. I was just going to give them away to a friend, but then I found out that I could sell old DVDs online, with a great new service that I just heard about. 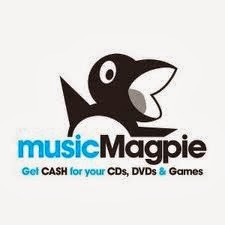 Music Magpie makes it possible to sell old video games online, or DVDs, or even CDs, for cash! The process seems to be super simple, which is great for me! You simply enter the barcode from your game, DVD, Bluray, etc.. on their website, and it gives you a quote as to how much you can get! If the price is right, Music Magpie will provide you with a free shipping envelope for you to send your items in, and they will pay you right away! What a great deal! Our house is shifting away from DVD's and Blurays now,and more toward Netflix and other on demand services, so it would be really nice for me to be able to say goodbye to these pesky cases once and for all! I wouldn't know what to do with myself if I didn't have them to pick up all the time! I absolutely HATE meeting people from Craigslist to sell items locally, and having a yard sale is just so much work for me. I am definitely excited to have another option for getting rid of clutter! Okay moms, let's be honest! What is your biggest pet peeve when it comes to the messes your kids create? Leave a comment below to share your thoughts! This compensated post was brought to you by Music Magpie.